The psychedelia of the 1960s was when the smoke got in your eyes. Listening to records of that era is surreal and colorful, mystical and mental. The roots of it are folk – like The Grateful Dead and Jefferson Airplane – just as much as they’re electric and elastic. Now, psychedelic rock is an umbrella word, describing an extended family tree of music. And since we’ve been living in a retro-renaissance, psychedelic rock is ample. There’s the reverb master and father figure, Ty Segall. There’s the forgotten cooler – but weird – uncle, Tim Presley (recording as White Fence). And then there are the new kids, Foxygen, that kind of follow you around wherever you go. This January, Foxygen released their second LP, We Are The 21st Century Ambassadors Of Peace & Magic where Pitchfork gave them their coveted Best New Music label, calling them “effortless” and “cool.” The single “Shuggie” was all over FM radio and they were listed as one of twenty bands Rolling Stone was urging people to check out at SXSW. Since then, Foxygen has found their corner of the Internet – with a public Tumblr post cataloging their arguments. They’ve behaved badly in public and garnered some negative attention, being called “tacky, cutesy and boring.” And to top it all off, singer Sam France has broken his tibia and fibula, postponing their tour. Foxygen has had quite the year. 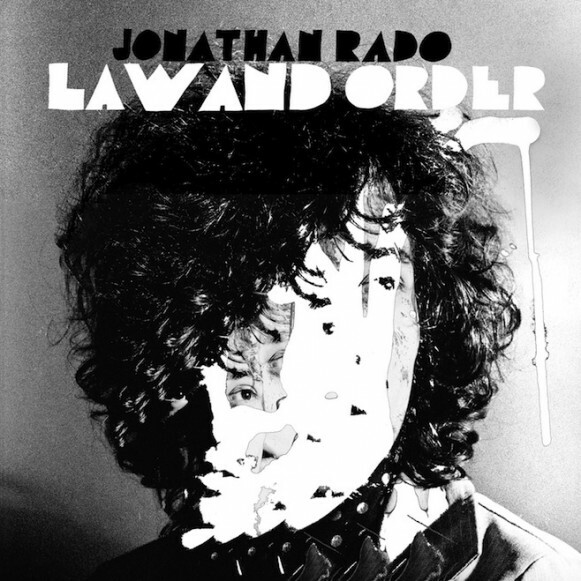 Yet through it all, guitarist Jonathan Rado found the time to record and release a solo LP. Law & Order is twelve tracks of back to basic, vibrant, lucid rock music. The record is patchwork psychedelic, providing you will a full sonic back and fourth. Album opener “Seven Horses” acts as foreshadowing, showing us how many directions this record will move in: polished beat keeping, uncanny lyrics and hypnotic sounds. Some songs are straightforward pop, like “Hand In Mine” and “Would You Always Be At Home?” – both of which feature male and female vocals, making sweet little love songs. Meanwhile, the vocals on “Looking 4a Girl Like U” are so saturated that you can barely make out anything. The detail on this track submerges you in sound, but you’re never suffocated. “I Wanna Feel It Now!! !” pulls and pushes you on two different trips. One shatters your brain into tiny pieces. The other sweeps it up with an acoustic guitar feeding on left and right panning. It’s the longest track at 5:23. And around the four-minute mark, gears change into an instrumental, slow interlude. Rado is experimenting with sound. Not overly noisy, it’s manicured. “Faces” is the most friendly. Released as a single with White Fence’s Tim Presely on guitar. It features simple, single-note ascending guitar solos and chorus hooks, layered vocals and electric key work – basically the modern equation for a psych-success. The two instrumental tracks on this record provide you with two very different daydreams. “Dance Away Your Ego” transports you to a beach blanket dance party while the title track acts as a repetitive intermission. Rado allows this record to breathe in and out. He’s taking the whole “vibe” thing very seriously. The only standout track is “Pot Of Gold.” While so much of this record is one way, “Pot Of Gold” is the other. It sounds like an outcast track from the Top Gun soundtrack. You can actually hear the computers while Rado doesn’t sound like himself. The cheese is knee deep with drum machines and chiming synthesizers that stick to you. It almost doesn’t make sense. But is psychedelia supposed to? Despite their undulating presence in music news, it wouldn’t be so bad if Foxygen followed around Jonathan Rado. Through it all, Foxygen’s music is charming. (Their live shows are even better.) And while it’s still early, it’s safe to say that Rado has found his happy place – recreating new versions of genres past. And with the strange shades and shapes he’s delivering on Law & Order, it’s fine by me.